Problem Solver Design attaches sway bar to Twin I Beam Axle. The noise can be caused by two types of failure. The first is when the sway bar moves inside the axle bushing during normal suspension movement. 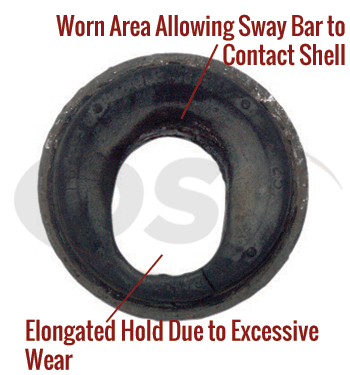 This causes the bar to slowly wear through the OE rubber bushing material. When it's worn down enough it will come into contact with the outer steel shell-metal to metal contact causing a noise. 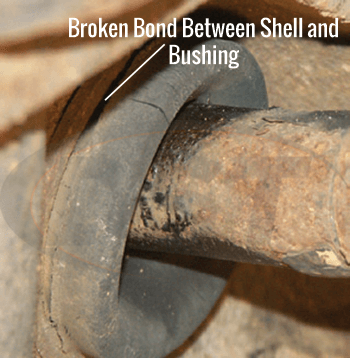 The second type of failure occurs when the bond between the rubber bushing and steel shell fails, allowing the rubber bushing to move along the sway bar.  Noises coming from your suspension can be aggravating and here at DST we understand that. We have a solution for you: Moog Problem Solver K80222. Moog engineered K80222 with premium polyurethane material for enhanced durability and service life. Because these sway bar bushings were built with polyurethane they are unaffected by oils, alkalis, ozone, hydrocarbons and can withstand extreme weather. This Moog Problem Solver reduces sway in turns, eliminates noise caused by metal on metal contact. 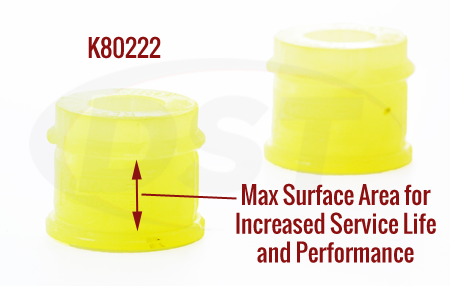 If you needed another reason to call DST's customer service and order K80222, add easy installation to the list of many benefits. using the silicon lube they popped in with modest pressure.. I like the poly sway bar bushings over the original rubber. You will need a press or large C clamp to install. Do I leave the metal shell of the original bushing in the axle when I install the moog-k80222 bushings? 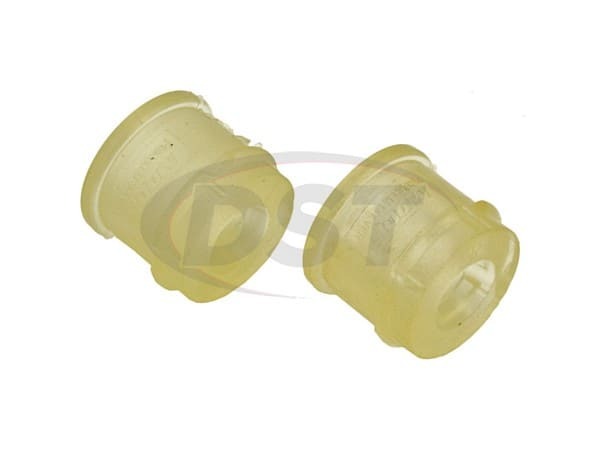 On the moog-k80222 Bushing kit, you will want to remove the outer shell of the original bushing as well. These bushings will not require the use of that original outer shell like other polyurethane bushings. Do I need to remove the entire stock bushing, outer shell and all for the install of the moog-k80222? You will need to remove the entire stock bushings, Outer shell and all for the install of the moog-k80222. Will I need to reuse the OE metal sleeve on part number k80222? Yes, you will need to reuse you OE metal sleeve for part number k80222. Does the sleeve on my E350 need to be removed before installation for part number k80222? Yes, for part number k80222, you will need to remove the sleeve. Do you need to also remove the steel sleeve in the I-beam before installing these or just the old rubber bushings?